Sipradi is a major player in automotive & allied business and is one of the largest and most prestigious brands in Nepal. Along with Sipradi Trading Pvt. Ltd.- the exclusive distributor of TATA vehicles, Sipradi Autoparts Pvt.Ltd., Sipradi Earthmovers Pvt.Ltd. Sipradi umbrella. Career with Sipradi gives you an opportunity to become a member of a highly growing company and a dynamic management team committed to building a high performance organization. > Diploma in Automobile Engineering with at least 5 years of experience in customer service. Two wheeler driving license is must for all the above positions. Own two wheeler is must for intern/Trainee positions. Salary and benefits will be as per the Company rule. 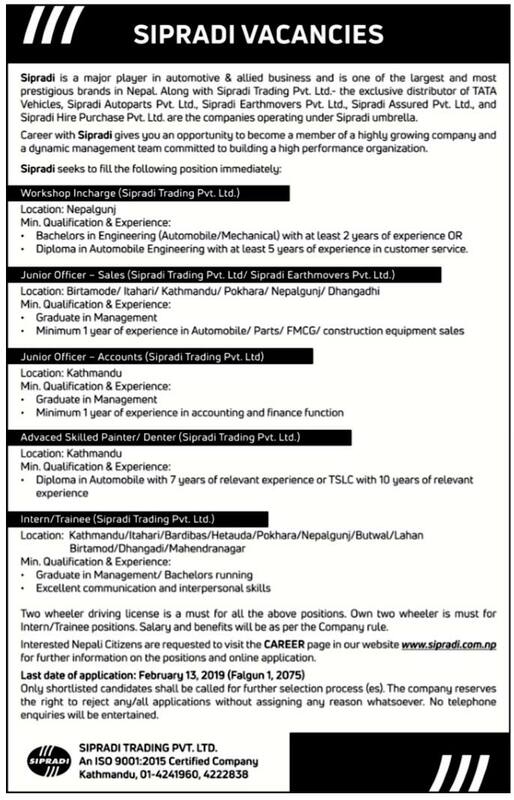 Interested Nepali Citizens are requested to visit the CAREER page in our website www.sipradi.com.np for further information on the positions and online application. Only shortlisted candidates shall be called for further selection process (es). The company reserves the right to reject any/all applications without assigning any reason whatsoever. No telephone enquires will be entertained.